On 26th September Hurricane Ketsana ("Ondoy") made landfall in the Philippines bringing the worst rainfall to Metro Manila among recorded typhoons. Millions of people were affected by the devastating floods which swept through the streets of the capital city. Families suffered damage to their homes and belongings were swept away - for some less fortunate, their homes were completely destroyed. After the flooding, food and water supplies were extremely limited. PCF volunteers prepare over 130 donation bags for distribution. 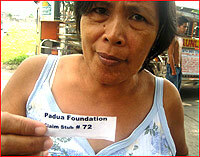 The Padua Charitable Fund organized a successful relief effort to victims of the devastating floods. The 130 families residing in a slum area in Paranaque known as "The Mangahan" each received a bag of items to help them through their difficult time. The familes involved were very happy and grateful to see us arrive. 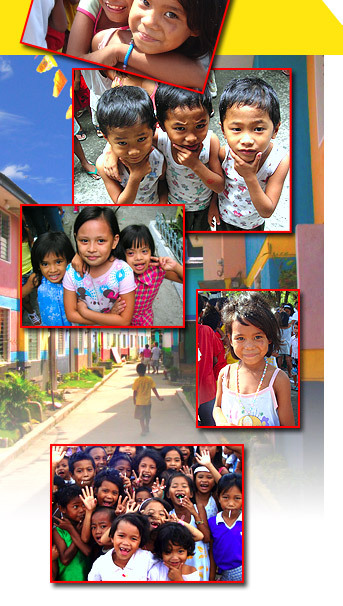 The Padua Charitable Fund is always ready to step in and provide aid in times of crisis to those who need it most. Families are happy and thankful to receive their goods.